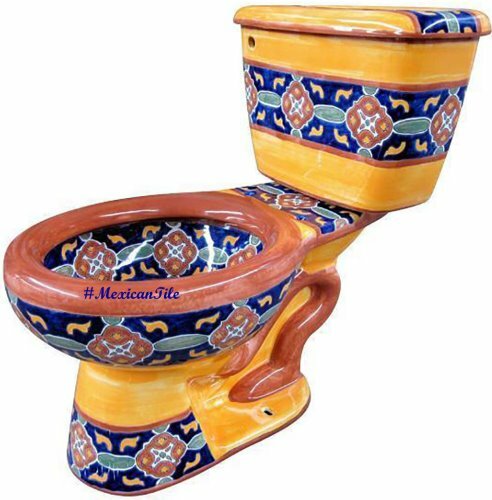 Colonial bathroom set consisting of Mexican toilet, talavera sink, wooden seat and talavera accessories. Toilet itself as well as optional products are decorated with the same Memphis toilet pattern. It includes such colors as terra cotta, yellow, blue and white. Use Mexican toilet page menu to select add-ons you would like to add to your order. Take advantage of WC free shipping offer with approximate delivery in the US mainland of six weeks. The time frame includes Mexican Toilet production.